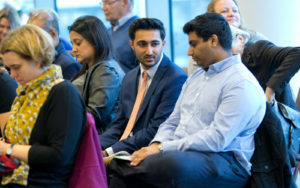 Former Kingsbury High School student Anuj Chitroda has been named as Panathlon’s Young Leader of the Year for his dedication to helping disabled children. Anuj, 18, was among the prize winners at the 10th Jack Petchey Foundation Outstanding Achievement awards on November 16 at the Olympic Park, awards which honour Panathlon’s top achievers across London and Essex. Anuj, who has now left school to study computing at De Montfort University in Leicester, was instrumental in the planning and delivery of a Sport Relief fundraiser involving 2,000 fellow pupils at Kingsbury High. He liaised with the school’s senior leadership team and coordinated a team of volunteers as he helped to raise more than £1,300. The event required careful coordination to ensure the wellbeing of young athletes and spectators, and Anuj was credited with instilling fellow organisers with a sense of calm and positivity throughout. A keen sports lover and talented communicator, Anuj’s skills were in evidence as he officiated at three Panathlon swimming events and received praise for his readiness to get in the water and help disabled participants, setting them at ease with his composed, confident manner. No event was too big or too small for Anuj, who assisted in the organisation of the school’s winter fair and a Christmas party for senior citizens as well as numerous Panathlon competitions across the course of a year in which he made a name for himself inside the school and beyond. Reflecting on his achievements, Anuj said: “It was really interesting how to adapt games to suit the children and make sure everything was having a good time. Before you’ve tried it you don’t realise what skills are needed but being thrown in at the deep end is the best way. “My favourite experience was being a Young Leader in the swimming competitions. Once there was a blind child in the pool, and I had to provide a different experience for him than with physically disabled athletes. The prizes on the day were presented by Panathlon Ambassador Liz Johnson, the Paralympic gold medallist swimmer, Jack Petchey Foundation’s Operations Director Geema Juma and special guest Matthew Key. Liz said: “Young Leaders are integral to Panathlon’s incredible impact. They have such a good temperament, understanding of the rules and the needs of the youngsters taking part.